The trick to this salsa is blackening on a cast iron skillet. Make sure not to stir too much. You want dark black patches on the veggies. The first almost 4 years of our marriage we lived in a charming, basement apartment (albeit creeping with cockroaches, the entire neighborhood was) of the most wonderful family from Mexico. We learned a lot living with them, and one of the biggest take-aways was Josephina taught me how to make her delicious salsa. Brent and I would beg her to make us salsa, as much as was possibly tactful. Finally, I asked for the recipe. I made several batches. No comparison. They all fell flat. I decided I needed a live tutoring session. 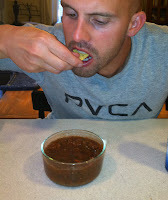 After several careful observations, my salsa improved dramatically. I discovered Josephina and I were from the same mold. We don't like recipes and rarely stick to one. I watched her like a hawk, and this salsa is the best semblance. I may have posted this before, but it is worth reposting. Turn heat onto high and blacken tomatoes, onion and jalepeno on a cast iron skillet. Combine the rest of ingredients into blender or food processor. Process. Add tomatoes and onions and process gently until desired consistency is reached.